I saw that and his comment was specific to the 3 girls who seemed to have bonded. I think Sophie agreed! I think they’re trolling each other even when not following, that’s whats up. Nick’s probably doing the same. Sophie follows two of the girls, the lifeguard who’s eliminated and Tennille. Initially Sophie followed a few lesser known girls but no longer. Britt followed Sophie earlier on but I guessed told not to. Should have screenshot it. The pink elephant is Brooke who’s acting like she cared for no one. She’s following Romy. Maybe she thinks she got a raw deal? Could be a troll but the guys IG looks like a normal bloke to me and he somehow knows F1 & F2! Maybe his friend lied? Sluething his follows..
Well, he's completely wrong on the maximum bet for Sophie so my verdict = Troll. @bachbee was this on IG or Twitter. His profile on IG is private? Any guesses on who the unhappy campers might be? Vanessa Sunshine? Was there anyone else who seemed a bit disappointed on the first night? Also saw an ad tonight on Channel 10 and it looks like Brooke uses the Bach pad key on Wednesday, although knowing 10 it could well be Thursday and they are lying about it. 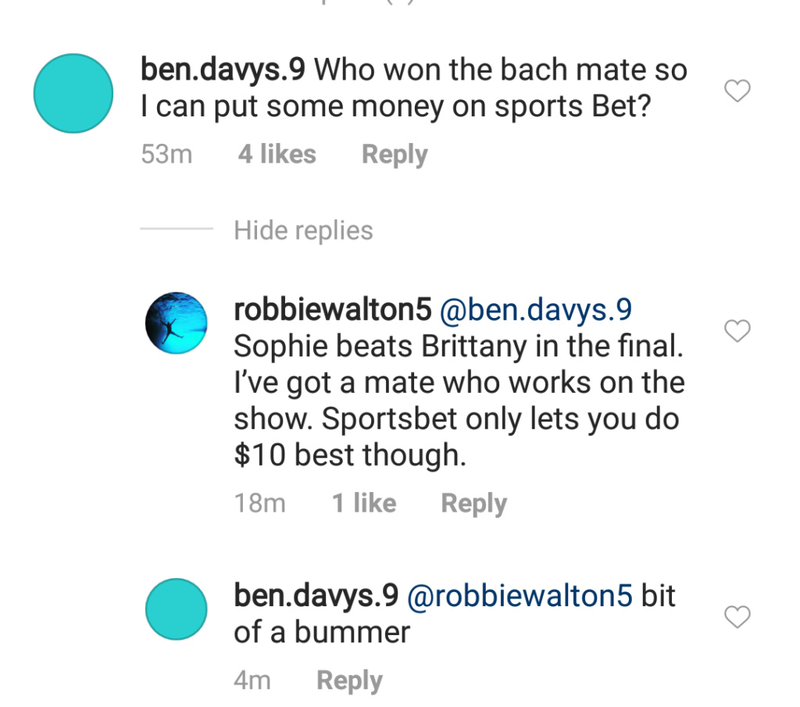 Even if guy commenting that Sophie wins is accurately reporting what he was told by his "mate that works on the show", I would question the credibility of the mate. If Mate does work on the show, he's probably spreading misinformation, IMO. 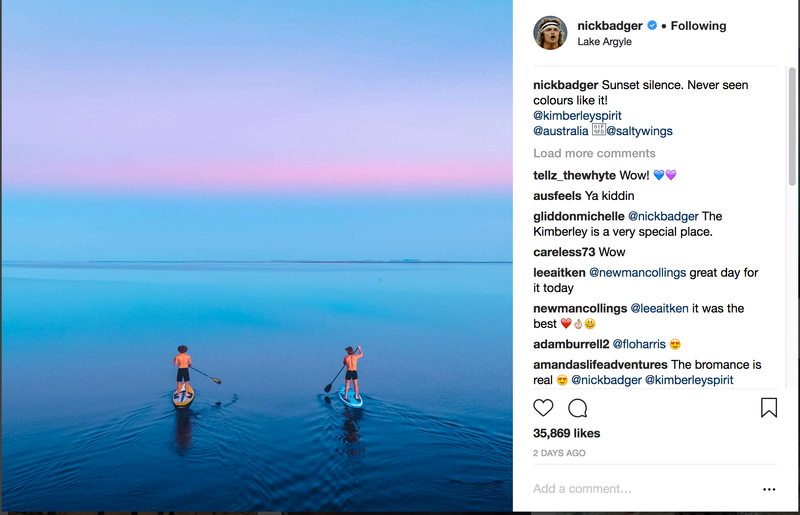 Has Nick been spotted in Perth in recent days? Would he be visiting Britt for a SHV? Looks like he flew SYD-PER for the weekend just gone, according to a post three days ago by a Qantas passenger on an airliners.net forum (he travelled in business class too!). "On my flight was that Honey Badger guy, sitting on the other side of the business class cabin. Didn't seem all that big to be a rugby player, tall but not big like what i think of as a rugby player." @Knowsarose wrote: Has Nick been spotted in Perth in recent days? Would he be visiting Britt for a SHV? Looks like he flew SYD-PER for the weekend just gone, according to a post three days ago by a Qantas passenger on an airliners.net forum (he travelled in business class too!). Thanks for giving me an excuse to post that gorgeous photo. @Bachbee wrote: Could be a troll but the guys IG looks like a normal bloke to me and he somehow knows F1 & F2! Maybe his friend lied? Sluething his follows..
Wow, talk about six degrees (or less). Looked up our man there and find out we have a mutual – someone who is well connected in Sydney entertainment/nightlife. So IMO he is not a troll or batsh!t crazy, but his “mate” has more than likely misdirected on purpose. Please post the link to where this came from. Please have a look at the rules. Source - A link to the source must be provided at all times. Any SM, any media, any quotes, anything that YOU didn't say requires a link. SM usernames are to be clearly indicted as well as the source. Clearly indicate if it's IG, Twitter, SnapChat IG Story etc. When posting Screen Caps, they must clearly indicate where they came from. If the poster created the Screen Cap from a youtube, or media article etc, a link MUST be provided as to where it originated. When moving a Screen Cap from one thread to another a link MUST be provided as to where it came from. When creating Screen Caps from your own source, this would be directly from a show that aired, you must state that's it's your own screen cap. When cropping resizing altering a picture/Screen Cap, you MUST state it was altered and a link must be provided as to where it originated. Under no circumstances can anything be posted from anywhere without a source linked as to the origination including typing anything word for word. We must follow the Copyright infringement law or posts will be deleted.